I've been enjoying the various holiday playlists on blogs, and I thought I'd put together a little mix that also includes more of my favorite, traditional carols & hymns (celebrating the true meaning of Christmas). There's a bit of everything - festive classics (& movie favorites), winter songs, and mellow hymns for Christmas. Hope you enjoy! (And if you have any other favorites, I'd love to hear). Listen to the playlist right here. Listening to this now and loving it! Thanks for posting. The First Noel will always be one of my very favorite Christmas songs. Love the playlist. :) Especially the Happy Holidays remix and The First Noel. One of my faves is Johnny Mathis' version of Let It Snow. Thank you so much, I was listening to this lovely playlist at work today. Some favorite CDs of mine are Winter Rose by Ottmar Liebert and any of the Wyndham Hill Winster Solstice collections. 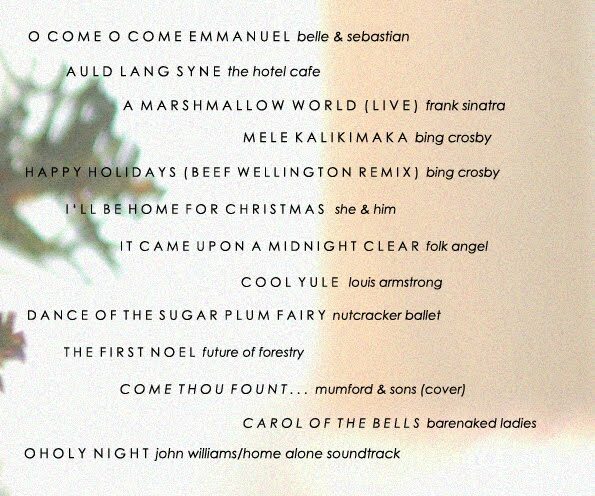 A couple of years ago iTunes had a great holiday sampler for free that I also love - track list is here: http://www.zdnet.com/blog/apple/free-20-song-holiday-sampler-in-itunes-lp-format/5511 . Maria, thank you for these wonderful recommendations!